Salt is an abundant and valuable natural resource in Kansas. In addition to salt's well-known uses (such as table salt or road de-icing material), large caverns dissolved out of salt beds also are used to store natural gas, natural gas liquids (such as propane and butane), and other petroleum products. 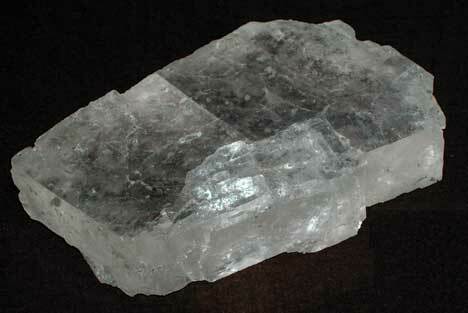 Halite (fig. 1) is the mineral name for salt. The chemical composition of halite is NaCl, or sodium chloride, which is the same as common table salt. Salt is a general term for naturally occurring sodium chloride. Rock salt is the term used for natural salt deposits composed of halite and other impurities, mainly thin beds of shale. In Kansas, salt is mined from the Hutchinson Salt Member of the Wellington Formation (fig. 2), deposited during the Permian Period, about 275 million years ago. The Hutchinson Salt Member covers about 37,000 square miles in the subsurface of central and south-central Kansas (fig. 3), reaching a maximum thickness of more than 500 feet under Clark, Comanche, and Barber counties. About 80 percent of the rock in the Hutchinson Salt Member is salt (much of the rest is shale)-more salt and fewer impurities than most salt beds. Figure 2--Sequence of rocks associated with salt deposits in Kansas. Thick salt layers also occur in western and southwestern Kansas in the Ninnescah Shale, Blaine Formation, and the Flower-pot Shale. Most of these salt beds, which have never been mined, are much deeper below the surface than the eastern edge of the Hutchinson Salt Member, where mining occurs. Figure 3--Approximate limits of major salt deposits in Kansas (modified from Bayne, 1972) and location of active salt mining. Thick salt layers also occur in western and southwestern Kansas in the Ninnescah Shale, Blaine Formation, and the Flower-pot Shale, which are above the Hutchinson Salt Member in younger rocks. These salt beds, which have never been mined, are much deeper below the surface than the eastern edge of the Hutchinson Salt Member, where mining occurs. This circular provides a brief history of salt production in Kansas, explains the geology of the salt deposits, describes how salt is mined, and discusses environmental issues associated with salt deposits and salt mining in Kansas. Why are the Quivira Marshes Salty?